In RFEM and RSTAB, you can import DXF files via the import function. 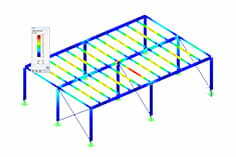 These DXF files can be used as the basis for modeling a structural system. In principle, you can divide the import into two categories. In RFEM, you can directly import the DXF file and create a new model. Here, the lines of the DXF file are imported and lines are automatically created in RFEM. In RSTAB, you directly get members with a placeholder as the cross-section at this point. The name of the line's layer is assigned to the cross-section. 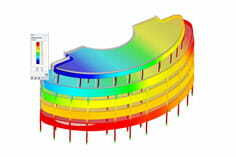 For example, if you create a cross-section name such as IPE 100 for the individual layers in the CAD program, this layer is directly created in RSTAB as a member with the cross-section IPE 100. When importing a DXF layer, separate settings can also be made before the import. For example, you can swap axes. In RFEM and RSTAB, you can also import a DXF file as a background layer. In doing so, a picture of the DXF is effectively placed in the background of the graphic. You can then create lines and members. The advantage of this option lies in selecting the nodes of the background layer via object snap and thus being able to quickly create a structure using the snap points. If you have imported a DXF as a background layer, it can be customized. It can be moved, rotated, or scaled. These manipulations can be carried out in the project navigator under the guide objects.